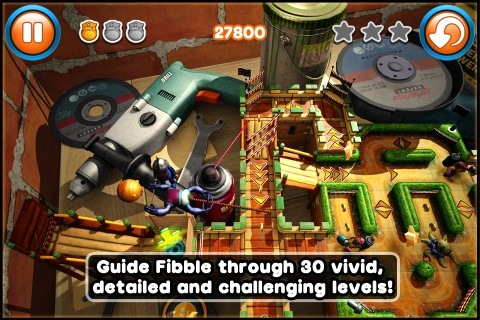 Fibble for iPhone and iPod Touch is a fun puzzler app full of strategy, challenge, and creativity developed by Crytek. With a nod to Toy Story and Monsters Inc., Fibble is a cuddly creature from outer space tossed into a suburban home on earth. He and his band of cute monsters were knocked off course, when their space ships encountered space trash. After running into a soda can, Fibble finds himself in the kitchen, and you must flick, roll, and bounce him through obstacles to find his friends and go back home. The Fibble puzzler app requires not only strategy, but also deft gesture control to be successful. You are moving Fibble and the other monsters within a multi-dimensional space. Fibble, the monsters, and the obstacles react not only to your gestures, but also to the impact of your gestures in the game. If you fling Fibble with a lot of force and are unsuccessful, Fibble will smack into an obstacle, roll back with force, and land not entirely how or where you would expect. The gesture controls are extremely responsive requiring a delicate touch and appropriate timing to flick Fibble, touch the screen to make it jump, and roll successfully to the landing spot. For each level, you receive medals and points based on the number of flicks you make. If you’re unsuccessful, then you have to do the level again. As you progress, you encounter more of Fibble’s monster buddies who bring a unique movement to the obstacles. Byte brings a bounce, so you have to tap it at just the right moment. The obstacles become increasingly difficult, but not so complicated as to make it beyond your young ones’ grasps. 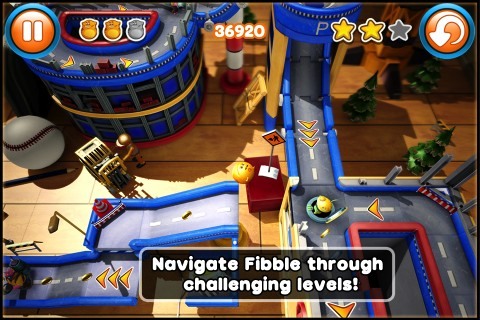 The Fibble iOS game brings a nice feature to the experience with a quick overview of the obstacle. This opportunity to develop your strategy is helpful. Also, an insightful pop-up on the screen might help you find success. The obstacles are a cool blend of ski ball, pinball, miniature golf and Pac-Man. When you hit stars, you earn points and power. When you bounce or jump a level, you may flick and touch with great momentum to earn points with your speed and accuracy. The borders of the obstacles are like boxing ring ropes. They have movement, so a stumble or poor flick may bounce you from side to side resulting in slow speed and eventual defeat. The gesture controls are challenging, yet exciting as a result of the life and energy of the game play. Visually, Fibble for iPhone is incredible. The intersection of monsters from outer space and a suburban home always creates an opportunity for an interesting juxtaposition. Obstacles are set on a cutting board next to a chopped carrot, on the refrigerator shelf next to eggs and milk, in the bathroom next to toothpaste. The graphics are well-executed, appropriate, and fun. Fibble is full of energy and life. It is challenging, but it’s extremely accessible. You and your kids should download Fibble from the iTunes App Store, connect on Game Center, and have fun chasing one another on the leader board. Note: This is not a universal app, so if you want to play Fibble on your iPad as well, you can purchase Fibble HD (iTunes $4.99) instead which gives you both versions in one download. AppSafari review of Fibble was written by Jenni Ward on April 18th, 2012 and categorized under App Store, Featured, Games, iPad apps, Puzzler, Universal. Page viewed 3784 times, 1 so far today. Need help on using these apps? Please read the Help Page.